The term "quiet horror" gets thrown around everytime you read any review of a Charles Grant story. What exactly is quiet horror. Simply put, its a moniker created by Charlie himself, as a way to describe his writing style. Quiet horror is a slow crescendo of dread that builds in the story. It's subtle, not in your face. Its a creepy feeling that something isn't right. It's also not for the person who has the attention span of a highly caffeinated squirrel with ADD. You're not going to find blood spattered on every page of a Grant story. Nor will you find non-stop action. This isn't a Marvel comic. 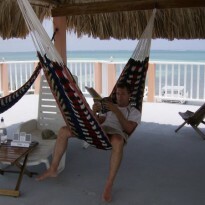 Grant's stories are all about the ride and not necessarily the destination. Patience is key. If you have it, chances are you'll see what he's trying to create and you'll enjoy it. Now, is every one of his stories a hit? No. But, there is always a certain level of quality in every Grant tale. 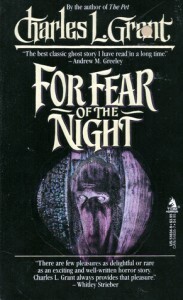 For Fear of the Night is no exception. Is it his best? No, again. As Labor Day nears, a group of teenagers are preoccupied with the big changes that have already shaped their lives and the ones that are about to. Going off to college looms in around the corner. Couples are about to become apart and wonder whats in store for them. Career decisions have to be made. Their friend, Julie, was recently killed in a fire that happened in a building near the pier. Devin, the groups older photography friend, receives a message on his answering machine from their dead friend. Was it really her? Is it some sick prank? He doesn't know, but it sparks off the mystery of what really happened to Julie. For Fear of the Night is not Grant's strongest story. Very little action happens for the first 100 pages. It's his typical slow burn. The storytelling and atmosphere are still there. The ending strikes me as a bit muddied and leaves more questions than answers. If I were looking to read Grant for the first time, this wouldn't be the one I'd start with. But, if you're looking for that quiet horror that he specializes in, you could do a lot worse.